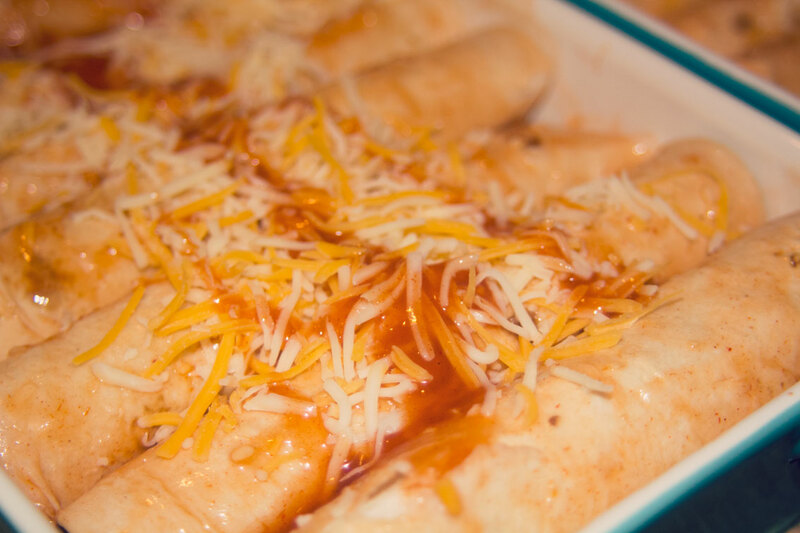 Enchiladas are great when you’re feeling like transporting your taste-buds to something south of the border. This is an easy Bachelor Cooking original recipe that you can serve by itself or with some chips & salsa. Pour 1 can of Enchilada Sauce into a large bowl. Pour a good bit of cheese into a bowl. Take your pre cooked rotisserie chicken and pull small chunks of chicken off and put it in a bowl (thus making shredded chicken). Pull out a baking dish or casserole dish and spray it with no-stick spray. Dip a tortilla into the bowl of enchilada sauce and make sure it gets fully soaked. Put the tortilla into the baking dish. Fill it with some cheese & chicken and roll it up. Position the rolled enchilada so that the seam is face down (this keeps it from unrolling). Repeat steps 5-8 until you are out of room in your baking dish. 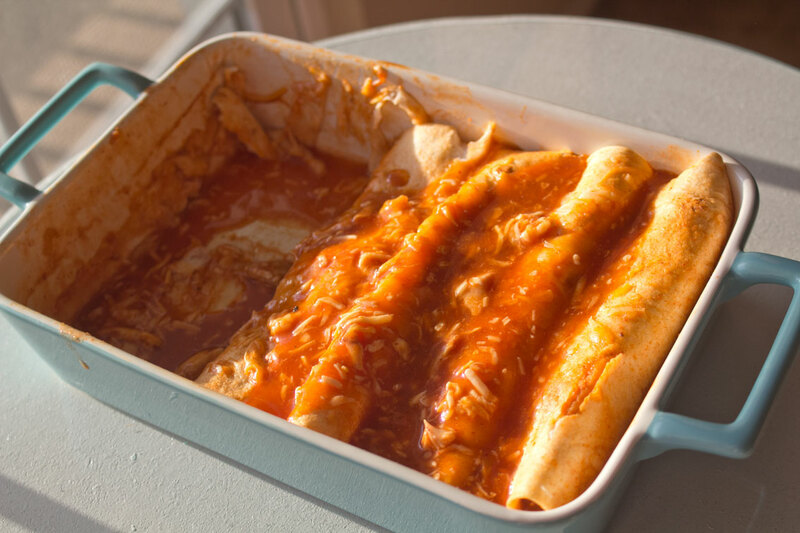 Pour the 2nd can of Enchilada Sauce over the enchiladas in your baking dish (drizzle it real nice like). Sprinkle some extra cheese all over the top. Bake at 350˚ for about 10-15 minutes. Pull it out of the oven before the tops get too golden-brown. Read all the instructions before you get started (that’s a general cooking rule). Pull out all of your ingredients before you get started–it helps things go quickly. This also makes good leftovers. Take it to work in a container after you’ve cooked it and microwave for 1:30. Voila. Check back often for more Bachelor Cooking recipes.